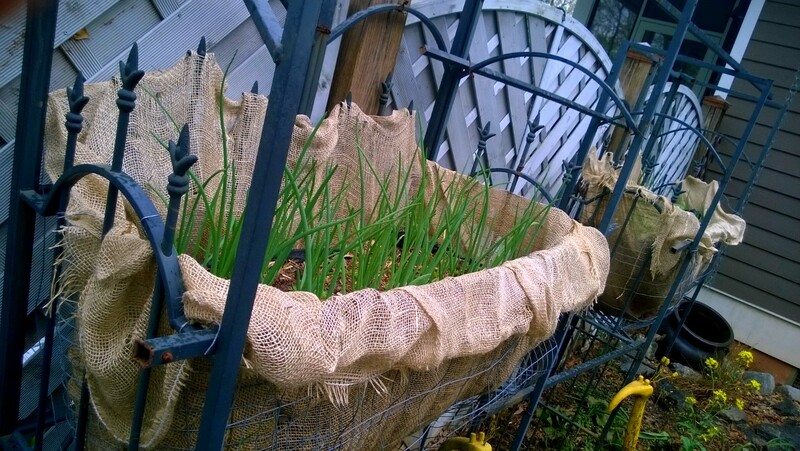 You remember earlier in the season when I told you about my fantastic brainstorm to create these stunningly amazing growing baskets out of chicken wire, burlap, weed block and my 4-in-1 dirt (1 part hay mulch, 1 part sand, 1 part hummus, 1 part composted cow manure) high above the chomping incisors of marauding rabbits? Well, they were – and are – still stunning…. but I forgot a basic fact when I chose the vegetable to inhabit said stunning suspended medium. 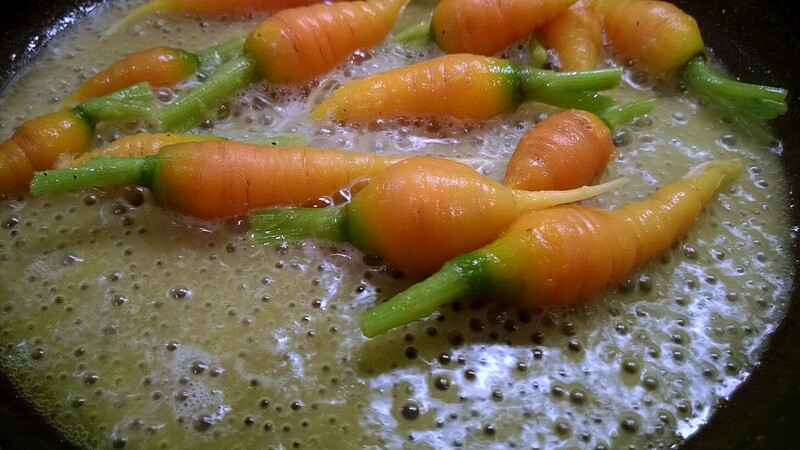 Carrots, like a great many other rooty-type vegetables, like a hot head. 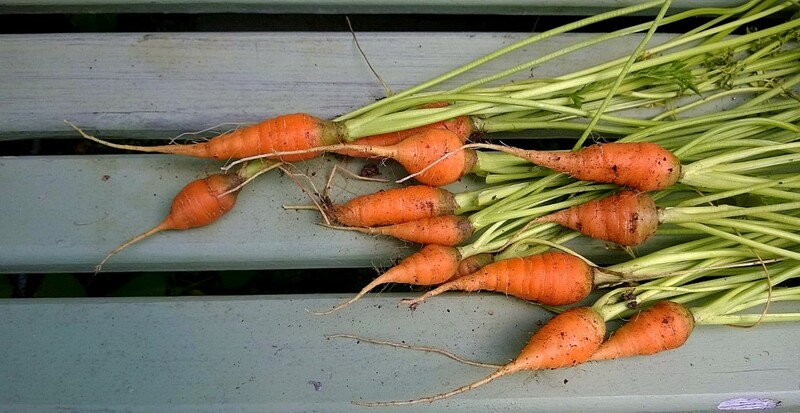 However – carrots (once again, like any other rooty thing) need cool bottoms in order to achieve maximum rootiness. Hot tops and hot bottoms gives you supreme stunted rootiness…. much like … say… a hot summer day and a 40 year old guy in a very cold swimming pool…. 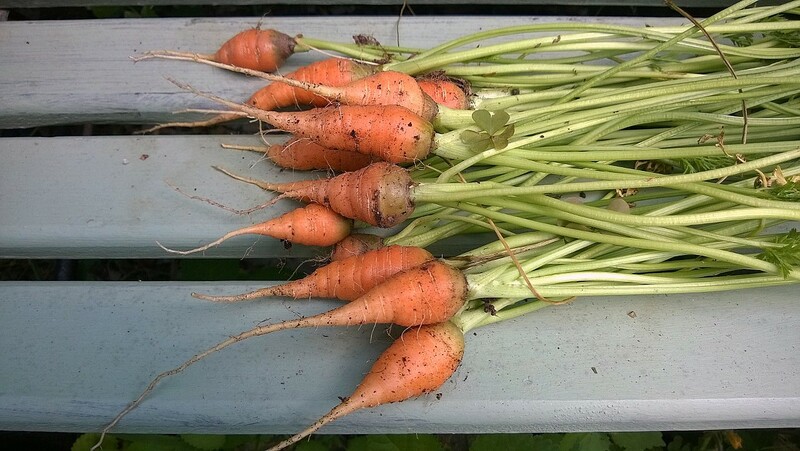 … I’ve got a bumper crop of short, stubby, diminutive chantenay carrots to deal with this year. Which if you’re someone like me that gets all gooey over baby vegetables – (I can hold dozens of them in my fist and pretend I’m a giant…. ) it’s a very good thing. … especially when you’re dealing with the mean, ugly, chubby, step-brother of the carrot family. 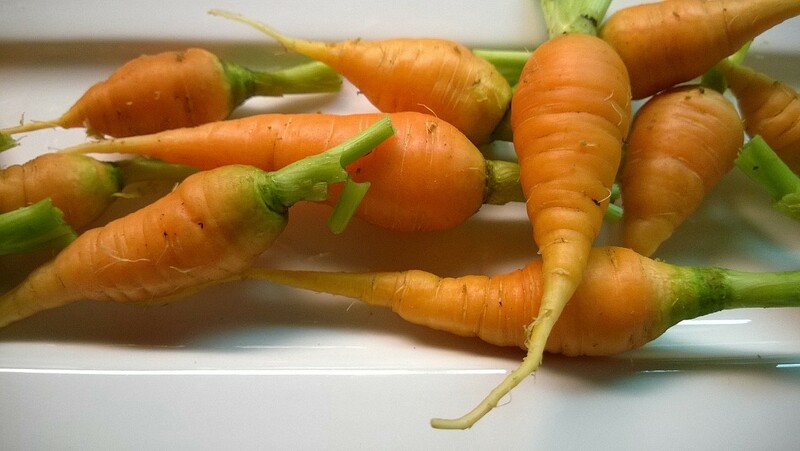 Chantenay carrots are typically used for roasts or stews. This is primarily because when fully mature, they’re huge.. and meaty.. and not terribly sweet. Packed full of flavor, they lend themselves well to adding body and texture to any long, slow braise – or parboiling and grilling – without the worry of disintegration over the fire. 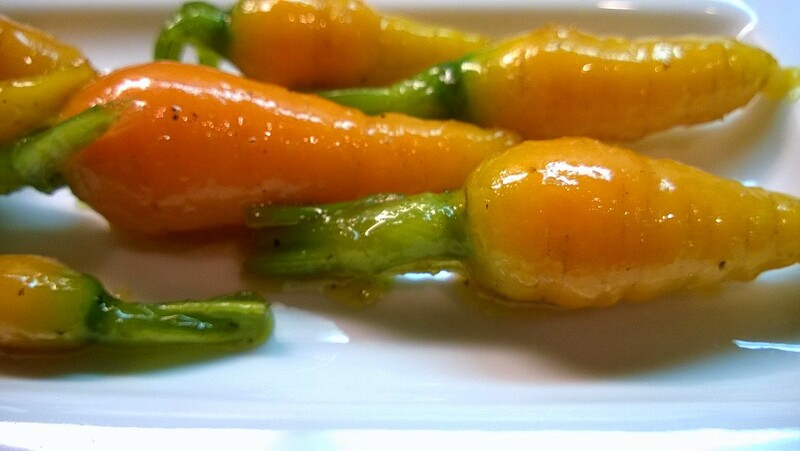 They are one of the few “baby” carrot varieties that still have an intense carroty flavor. What… you say those “baby” carrots in the little cello bags at the market have flavor? 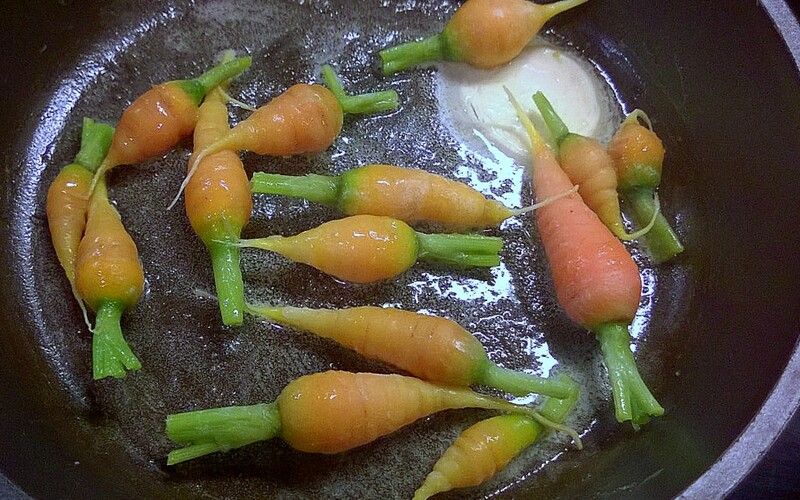 You’re right… those do… but those aren’t really Baby carrots. Those cello bag monstrosities are actually just full grown Danver carrots that have spent an inordinate amount of time in a kind of vegetable lathe to shave them down to baby carrot status. So, we’re really talking apples and oranges here. 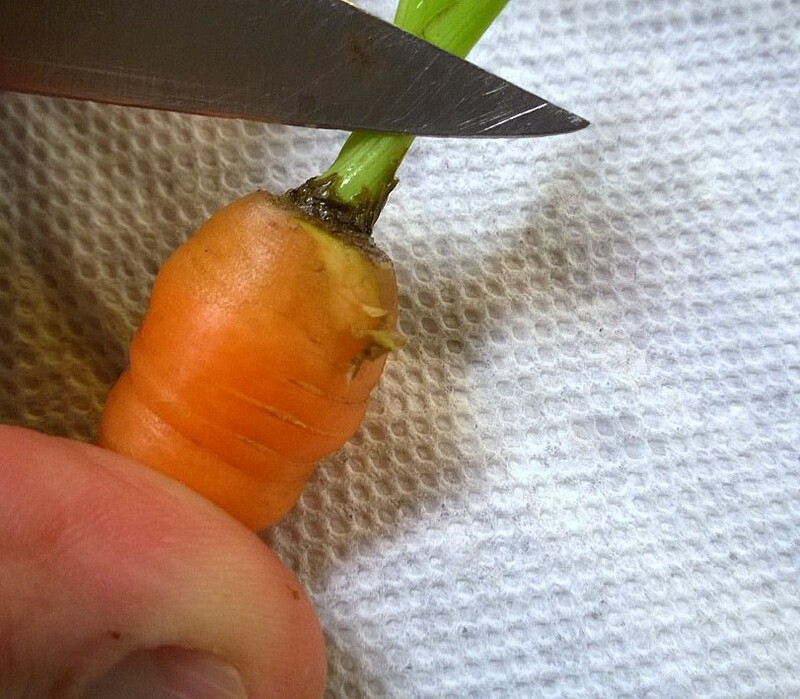 Baby Carrots are eaten skin on and top attached. (Why go through the work to prepare them if what you end up with looks just like those cello bag thingies.) So, we’ll go through the steps to get them ready – and then, make some Curry Glazed Baby Chantenays out of them. Place the prepped carrots in the zipper bag and micro on high for 2 minutes; remove and chill in the ice bath. Thank you so much – they really were sinfully good.